Take your bunnies to the far reaches of the Earth to solve the riddle of The Mysterious Places! Discover the near limitless powers of the Extra Super bunnies! 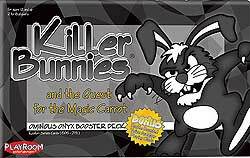 Just count the number of bizarre bunnies in this deck including Ambassador Bunny who lives with an opponent, Brundle Bunny who can escape any weapon but gets extremely hungry and Bunny Detroit who can only be attacked by a Mom. Finally, even Oscar would be hard pressed to pick his favorite of the 9 Celebrity bunnies that range from the Earth, to the Heavens, and beyond the Cosmos. Can you determine The Fifth Element (I thought it was Boron) or Follow The Queen to safety? Confiscate the Carrots of a Goody Two Shoes or trade unwanted cards with the Dark Violets. Perhaps you'll rule the military with President Ficus or lose your rank with a Court Marshall. Matrixing may provide a spare bunny, and Insurance Porpoises may guarantee its return. It will be best to avoid the Delinquent Minors or the demolitions of Two Fish In A Tank. The Bunny Circle may be suddenly cleared by an Extremely Terrible Misfortune or players may have to start dancing to the Time Worf. Are you seeing it live or looking through Hubble? Believe your eyes, the Onyx Deck's a double!